From laptops to servers, from printers to security systems, we carry all things techie in our two retail stores! From onsite service for our business clients to in-store repair for our home users, our certified techs are here to help! Advanced Computer & Graphic Solutions (ACGS for short) is a small technology company with two offices located in Atlantic and Panora, Iowa. Both locations offer a full-service technology store. 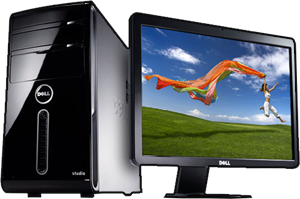 We are an Authorized Dell retailer and sell Dell laptops, desktops, AIOs, servers, printers, and much more. We also sell over 70 brands of other types of technology peripherals including routers, cables, software, IP camera surveillance systems, and other electronics for home consumers and business clients alike. In addition to our retail stores, our certified computer & network administrators provide complete IT service & consultation to well over a thousand clients. For the home consumers out there, ACGS offers a full-service repair center in the back of each retail store. For our small and medium sized business clients, we offer complete and comprehensive on-site computer and network service, installation and repair. Here at ACGS, we aren’t an overly large technology firm, but we are large enough to effectively service our customers in an excellent manor. We truly take pride in the positive relationships we have with our customers and we would love the opportunity to help you in any way regarding to your ongoing technology needs. One of the biggest hassles of getting a new computer is trying to get the data off of the old computer. We will transfer the data from your old computer to your new computer for you for free. We’ll take care of it for you! We are not only certified computer technicians and network admins, but we are also Dell certified, so we know computers and we know Dells! We’ll easily explain about each Dell model and what its internal components are for. We’ll help you pick out the best computer for your needs! Buying local really does mean something. We are a locally owned and operated business, so your sales dollars stay in the community. In addition, we are a proud financial supporter of local organizations, schools, and community projects. Buy local and support your community’s economy! Dell has some of the lowest prices in the computer industry, without giving up quality, so you can feel confident that you are getting the best pricing available. Now, all of these “value-added” services are worth about $150 per computer, so you can be assured that you are getting the best deal when you buy from ACGS! we try hard to explain things in a way that’s easy to understand. getting top quality, highly knowledgeable techs working for you. We’ve done the work, we’ve passed the tests, and we do it left! You can bring it on in, or we can come to you ••• whatever works best. well as On-Site service within our very large service area. means that we have a vast working knowledge of all things techie! printers, routers, security cameras, phones, software, and more. your satisfaction above all else. Guaranteed.